Club Penguin Cheats by Mimo777 Club Penguin Cheats by Mimo777: Club Penguin on iPad, iPhone, iPod Touch? Not sure if you have been following some of the techy stuff out there. The new iPhone is coming out soon and they are selling zillions of iPads! What is Club Penguin going to do? You may not know this but Club Penguin is made in Adobe Flash. BUT FLASH DOES NOT WORK ON iPhone, iPad and iPod Touch! All these Apple devices use HTML5 instead of Flash. Well, Club Penguin will need to make a decision. First do they care? Of course they do! They want and they need more penguins, right? 1. Do nothing. Not smart. 2. Convert Club Penguin from Flash to HTML5. BIG BUCKS! 3. 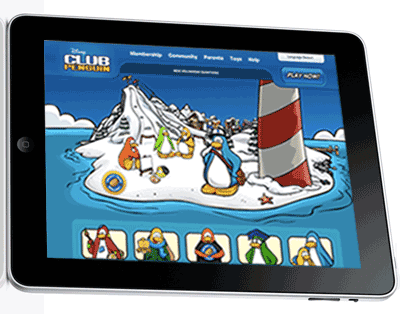 Make Club Penguin into an iPad Game App. This might work. This might NOT work. 4. Just make Club Penguin Mini Games for the iPad and stay with the Flash site. Now here's what I think they will do. Club Penguin has made 2 Nintendo DS games. They are making a Wii Game. I think they WILL first make iPad/iPhone Game Apps! They will do this first before making it possible for full Club Penguin game to be played on the iPad/iPhone. I THINK CLUB PENGUIN WILL BE THE FIRST REAL BIG VIRTUAL WORLD TO CONVERT THEIR FULL GAME TO IPAD! Hi mimo777! I might get an iPad and i hope they change it! Sweet! Although i dont have any apple stuff (and i really want some) They would make money! what if they change and some of their other players cant change to that and they lose them. But otherwise, its a really good idea! I actually have a free app on my iphone called "Clowd Bowse", and I have actually played Club Penguin on it! Its so hard to move around since you don't have a real mouse, but still, its pretty cool! Check it out Mimo! Yeh, that'd be nice if they did make a full game for iPad... But it's not possible to convert CP from flash to HTML5, I know html5, ALL online virtual worlds ARE flash, NO OTHER WAY TO MAKE THEM!!! Yeah I asked Club Penguin about 1 or 2 years ago if they were going to put club penguin on the ipod, Zune HD, and iPhone. Or if they would convert (if possible) the stuff to silverlight. They could also put it on the NEW WINDOWS PHONE 7, oh yeah!!! Club Penguin Does have Apps one is called Club Penguin Game. More Club penguin apps are coming soon. There are club penguin apps one is called club penguin game. Also more is comming soon. Acctually your completly wrong, Farmville by Zynga has 10 times as many players as Club Penguin and is on the IPhone, Ipad and Ipod Touch. Farmville is NOT a Virtual World. It is considered a "casual game." I don't think changing a WHOLE website for apple products is really... good. wouldn't everyone have to change if they changed? Plus, more penguins have computers than ipads and stuff right? Just stick to mini game apps for now. i dont have an ipad or an iphone or an i-anything. but i agree with u mimo. that would be a smart choice. Mimo, I don't think that they will make an app (keep reading!). Disney would spend money on making something that could fetch more money for them, like Toy Story or Disney Princesses (yes, I am an avid Disney fan). Steve Jobs does own A LOT of stocks for Disney (which is the owner of CP), so he might have an influence in making the game HTML5... which is good. Making an app would take time, plus you would have to become a developer, which costs money, and making the app and hiring the people to make the app costs money too. Converting CP into HTML5 would be more cost efficient... if you get what I mean. Using the safari on the iPad (I have one :D) isn't too bad, so it wouldn't be ridiculed like Wolfram Alpha which made a paid app, when you could always just go to their website using safari. But one thing I don't get about your post was how CP would make big bucks by using HTML5. Because they would just make people who play CP happy, but it wouldn't exactly make money off that type of technology. Back to Steve Jobs... He could make some Disney ads be available for iAd which is coming out with the release of iPhone OS 4. ...And again, CP is part of Disney, and Steve Jobs is a strong supporter of them (did you see the Apple computer in the Toy Story 3 trailer? ;) ), so CP... COULD. A BIG MAYBE. Earn money off this new technology. But is CP doesn't get enough people paying the big bucks, they WILL, no doubt, collapse. Disney, the owners of CP, may decide to keep it because of paying customers. Disney can support itself financially, so that's possible. Sorry but did you even read the post? Club penguin isn't on Ipad but it might happen in the future. Sorry if I burst your bubble! I am going with options 1 and 4.
don't have that new type of flash. Option 3 sounds cool but I don't think it would work. And they would also have to remake some games because ones that use arrow keys wouldnt work so well like cart surfing..
likely. If you want to go on CP wait until you can access a computer! You don't need to be on CP 24/7! Number 4 would make the most sense it would be cool if you could upload coins from the minigames as well. And you have to remember they are working on a new video game, club penguin EPF stuff, adventure party, and more on cp. They may not seriosly THINK about this idea for a few weeks. But since we are talking about portable stuff, when is the next downloadable mission coming out for the EPF DS game? I could sure use a new EPF mission right now.. I think they should do 1.
iPads are sooooooooooo awesome!!! The substitute teacher I had last week brought his in, and it was so cool!!! I even got to hold it!!! The thing is about iPhones, iPads, iTouches, and iPods can't have every single game in the world be able to be played on them. I have and iPod, that can only store music, videos, etc. but doesn't have internet, a camera, or a camcorder. I'm probably going to get a Flip Video for my birthday, but that only has a camcorder. Sorry, getting off-topic, but I think people just need to play Club Penguin on computers, and play CP mini-games on iPads, iPhone, iTouches, etc. Club Penguin shouldn't have to go through so much work to be able to play Club Penguin on any Apple Inc things. That's just my opinion . i have a ipad and i wish club penguin were on it. then more penguins to play. at any time!! i got ipad and if club epnguin on there woot more penguins for me!! that is very strong opinion and yes more people do have computers more than apple products but that change WOULD be good you have to admit! i mean i have only one compter at my house and while someone else is using the computer i go on my ipod touch but i wasnt able to go on cp but now i can even go on clubpenguin! Club Penguin needs to realize that not everyone has an IPad! They need to make games for more popular games and stuff! no, sorry they do not have club penguin on Ipad yet. I really hope they change it because that would be so cool to play on the Ipad and ipod touch. Waddle on! Wow Mimo this is the first time I've seen u comment. This is cool! Thanks for the suggestion. All penguin ideas are appreciated and considered, so keep up the great work! Keep in mind, Club Penguin is meant to be played on a computer. I have an iPod touch and I don't think it would be easy to play club penguin on that small screen. It would be better on the iPad. But I do they could make some apps where you could play minigames or missions. Club Penguin probably won't work as an HTML5 file. I think Flash is better than HTML5 ( even though Steve Jobs says it's just as good ). hey mimo, isn't it Macromedia Flash? ```````````````````````````````````i think your 100% right. I just found out that when you try to recycle the postcard from the epf it says, "are you sure you would like to recycle this postcard from Shahrey?" Actually Mimo, Club Penguin already has a CP minigame app for the iphone/ipod touch. Check the app store! It looks like some sort of a "Hamster Launcher" rip off, but using puffles instead. You can call it Macromedia flash or adobe. Befor about 2005 there was macromedia, and Adobe systems, their rival. after 2005 Adobe systems bought Macromedia. Macromedia came with flash so now adobe has flash. So really it should be called Adobe flash, but it dosnt really matter. I hope this can clear things up! Mimo777, actually club penguin does not need to change anything as iphone 4 is coming out WITH FLASH. That's because penguins send those cards to you, not Club Penguin. Waddle On! Hi mimo! This whole incedint is apples fault. I am a huge tech guru myself so I had to figure this out. Well first of all i went to my dad. He knew because he likes tech stuff to. Ok so here is whats going on. CP is using flash which is a very nice programming enviromemnt. Adobe makes flash and flash player. Apple dos not let the ipod, ipads, or iphones use flash because there are some websites where you can watch TV shows or listen to music for free. Now they run on flash. So the point is that apple wants you BUYING the stuff through itunes instead of free through online sites. So the dont allow flash player on the ipod iphone and ipad. It is all apples fault. Its not cp's or adobes. I personally hate the idea!! I hope you find this helpful. Will you please post this on a new post so everyone else will get it? My penguin name is Mr Frizzel. Actually, they only get about ten percent of the money for each item bought, but you are probably right for part of it. Flash would probably use too much memory. Its harder then you think. Actualy I have a Ipad, and clubpenguin works fine on it! P.S. APPLE IS TAKING OVER THE WORLD! Hmm... True. Mimo should have noticed this. It is pretty obvious that there are many more virtual worlds already up and running on the I phone and other devices. CP's ultimate downfall will be its lack of versatility. It is not able to change to keep up with the pace of the technology. I figure that CP's membership revenue will drop significantly in about 2 years. 0.o my friend just got an ipad for his birthday.Its like a really big iphone.He told me you can do internet on it but it wouldnt connect.In a scale of 1 to 10 i would give it a 7. I have an iPod Touch. I have always wanted it to allow Club Penguin but NOOO. They don't have Adobe Flash Player for that and I also need to say one more thing. Penguins are being banned forever because people report them for no reason. This is why the "population" of CP has died down. My friend and I have a really rare penguin and next thing I know, it is banned forever for no reason! Sorry, I just HAD to say that. I realized that too! I wish I could have sent my puffle a letter. Now that, that would be cool! I understand what you are saying but I can get You-Tube on my iTouch and i can listen to music and watch videos. Why would they allow that and not Club Penguin is the question. Actually, no. There are 2 different EPF postcards. 1 is the actual 1 from CP and the other would be from a friend. Your friend's name must be Shahrey and they sent you that post card. It is not actually from CP. I hope this helped! Yeah i heard that club penguin will be on the Ipad!How cool is that? I'm getting an iPod touch because I like mini-sized things! And I hope that you could play cp on all iPad,iPhone, iPod touch so it will be fair! LUCKY! I WISH I COULD GET ONE!!! :P! I've never heard of 'Cloud Browse!' Is it new? It sounds pretty cool! That's very interesting! Now I really get it! Thanks Mr Frizzel! I wish I could mod! Thats rather odd, but the postcard could've actually been an EPF invitation from the penguin Shahrey, and you thought it was the official EPF postcard. i meant to say Mario5422 (CPG Mod) sorry. Me and my bro went to an Apple store, and they let your use the iPod, iPad, and iPod Touch. My bro went on CP and I didn't think it worked. Hey there, Thanks for taking the time to contact us at Club Penguin! Unfortunately Apple devices do not currently support the Flash application needed to play Club Penguin. It is unfortunately up to Apple to decide whether or not they wish to support Adobe Flash or not. hey isn't the new iphone already out? then if they change it to html5 or whatever we will need that for the download so i might cant be #2 or whatever it waz. What you all need to realize is that HTML5 would not benefit just apple products. It would increase the graphics and I think you would also be able to play it on your wii or DSi. Flash is very old and the internet needs an upgrade. It probably won't even take that long to download it, if at all. What's the fuss about? You have a good choice and a bad choice. Choose the good one! im typing this on my dsi cool or what??? There is an app called Cloud Browse that can surf the web and play flash. I haven't tried it yet, so I have no clue how good it is. But just so you know, there is a web browser that can play flash! Hi mimo!!!!!! I will start modding again. OMG i never ever seen you right b4 lololol. Heyy guys! It's Torry 2007 again and I don't have an iPod touch, iPhone, or iPad. So I think you should just have club penguin apps. The only apple thing that i have is the newest version of the MacBook! That's it, but i have flash!!!!! In case you didn't already know, there is a new ruby in Ruby and the Ruby. So older penguins who already have the older ruby, well there is a new ruby now! It is a ring with a ruby on it. Just letting you know! Use a MacBook!!! Ha haha!! Or you could just hack into the iPod iPhone or ipad!! :) HA!!! MIMO, my dads been looking on the new iphone 4g and he told me that the 4g has an flash app so You and conect Your iphone to an apple and u will have flash. THE PAPRTY IS RIGHT NOW PLEASE COME!!! I understand, but I only have any ipod nano, no internet. So if i don't have this program on my computer, like a lot of ppl, ya, the ppl who have the ipod things will be happy, but the majority won't because the majority won't have it. I'm not saying the change is bad, I'm saying that it's not fair to a lot of ppl. O and btw, I only have one computer too. Wow, thanks to everyone who commented to me :) love you all! even those who don't agree with me. I know! that happened to me too! No i think somebody sent you that. You know the one you can send in real penguin life not CP? and the penguin was called Shahrey. I'm getting an iPod touch because I like mini-sized things! And I hope that you could play cp on all iPad,iPhone, iPod touch so it will be fail! I like BIG things! Im gonna make an ipod... umm... LARGE! what is the point of the iPad anyway? it's just a giant iPod Touch. I am here to help clear some things up about Adobe Flash Player. Adobe Flash Player is an add on to Windows of Mac OS. If Clubpenguin were to switch from Adobe Flash to HTML5 it would still allow you to play it on you computer. You would just not need Adobe Flash Player. If you have any questions please dont hesitate to reply to this. I hope this can help clear some things up about Adobe Flash, and Adobe Flash Player! You have inspired me to try this app. It is really a great app! I'm also glad that it is free. Thanks for sharing this with everyone! I play club penguin on my iPad and iPhone..its not that hard to do. Apple does not use flash and never will.. Ever. Clubpenguin will not switch over to html5 because it can not run on the servers, therefor it would not be muliplayer, and for it to run smooth for a non multiplayer game they would have to make a new ios to play the HTML web coding. It can't be done which is sad but there is also other ways to play clubpenguin on your I device. My b day is the 18th and i will mod more since it is summer vacation now for me. hey mimo, don't you already HAVE an ipad???? After the change was finished we could have another Beta Party! Or a flash party! I'm gonna go chill on CP now. If they care, they should make an app that is the full Club Penguin game so you can play it. Or they can make the site Flash and HTML5 so either way you can play it. I think these are the two best options. But its not an official CP product. Like playing CP on the wii (Which is REALLY HARD!). I cant! Oh wait i am now! I am! XD you can mod! It easy! I have heard of a thing called "Cloud browse" Which has CP on it! Lol, they must get a lot of mail! I think everyone can use HTML 5. Also, don't put CPG mod when your not modding. Thanks! Awesome! I'm gonna go look at it! Keep commenting! Lol! Nintendo ganes it is then! Was the iPhone even out then? I didn't know that! We'll just have to wait and see what they do! :O I'm getting it! It sounds fun! Ok, I think that's enough modding. Even though it was only like 2 comments. I’m glad to see how observant you are! I’m also glad to see how good you are finding easter eggs, and glitches! I’m sure Mimo777 will enjoy these easter eggs! Please, keep finding easter eggs, and glitches. Mimo777 would be very happy if you would. It is kinda impossible to convert a flash .swf file into html. Especially one as complex as club penguins. Minigames might be possible but not the whole game. That is so kewl but um how do u become a moderator.and i have an iphone and its possible i would never miss a cp aniverssary party again and partys.plus wuts an ipad.plus does it go with itouch too? Hey Mimo! Just get the app: CloudBrowse! It lets you see flash content so you can go on Club Penguin! I already have done it! I hope you become a mod someday and get an iPad! I have a friend named Safa, but you shouldn't be giving information about you, or your pals. Waddle on! Apple will never allow flach on the iPad. There is an app called cloud browse that accesses remote servers with websites saved on them. Therefore you can get flash on the iPad. That's how I get it on mine. I hope they do it for Itouch! I'm probably going to get one maybe this saturday! wish me luck. Hey Mimo, did you know the words Everyday Phoning Facil;ity spell EPF if you put the first letters of each word together? it's something i noticed a while ago. Actually, do nothing is not THAT bad of an idea. If they do nothing, they save money- lots and lots of money. And there's not too many kids out there that own an ipad, iphone, or ipod touch anyway because they cost so much. So cp could switch from flash, but it would cost them money and there's the possibility their profits do not increase.